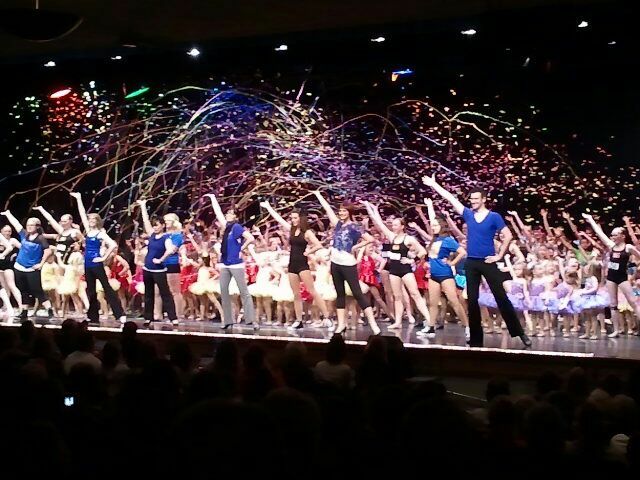 On Thursday, May 31st and Friday, June 1st, Lake Area Dance had their 5th annual dance recital. Since Grace is one of the competitive dancers, she performed in both shows. The recitals were at 6:00 at Central Middle School. On Thursday, I was backstage helping with the Sparkles (the 8-10 year olds). Their dressing area was WAY down on the other side of the building (not the studio’s fault). Luckily, I had a college-age helper to hang out/help with the girls who needed to go all the way down there to change. I mostly hung out in the “hall dressing areas” to help the smaller group of them get ready for their group dance, as well as solos, and trios. Their moms were also great about helping, so there was not much for me to do other than a few hairclips, and make sure they were ready at the proper times. Thank you moms for being amazing! Despite a music malfunction at the start of the show (causing a 20 minute delay), things seemed to run very smoothly. My husband, his parents, and my son all attended Thursday’s show, as did my ex, his mom and sister. They all seemed to enjoy it. My in-laws were impressed by the levels of talent, and that even the younger dancers seemed to know their dances pretty well. I didn’t get to see Grace much, except occasionally, while I was backstage with the Sparkles (since that’s where their dressing rooms were). I knew I’d be watching Friday night, so I was ok with that. Grace mostly got herself ready for the dances, with the help of some of the other dancers and moms that were helping backstage. Thank you to those that helped her! I did get asked to help shoot the confetti cannon at the end of the show. That was a pretty fun way to end a pretty fun night of hanging out with a group of super-silly, super fun girls! Friday, I was helping with concessions before the show. It was a bit chaotic, as the other mom who was selling with me and I didn’t know where things like programs were. We figured it out, and everything seemed to go just fine. Michael got picked up by my husband, but was really disappointed he didn’t get to stay to watch the show. What 6 year old wants to watch 2 dance recitals in a row? Apparently, mine! Just before the Opening Number, I was relieved of my duties, and headed up to the balcony to watch the show. The Theme was “Let’s do the Timewarp”. The opening number was a montage of songs starting with Madonna’s Vogue, it also had Nasty Boys and Old Time Rock and Roll. I loved, love, LOVED this dance!! It had all the competitive dancers, and several of the teachers dancing in it. It was awesome (and made me REALLY wish I was dancing in it too). Grace’s 1st dance (besides the opening number) wasn’t until the middle of the show, so I got to enjoy much of the recital before I had to run back to help her get ready between dances. I too was impressed that even the Kindergartners knew their dances well enough, that very few of them were watching the sides where the teachers were dancing. Besides the competitive dances, and the opening number, I also really enjoyed a tap dance to “Play That Funky Music” where the girls had on headphones. Very cute dance, and the girls seemed to know it well. I didn’t see too much of the end of the show, since I was helping Grace with quick costume changes, and also got to shoot the confetti cannon again. I found out just before her tap dance, that Daniel was very ill and wouldn’t be dancing with them. They covered well. If you didn’t know that he supposed to be there, you might not have realized someone was missing. The girls, and those of us who had seen the dance sure missed him though! All in all, I really enjoyed the whole recital experience. All the dancers worked hard, and did a great job! Previous Revving up for The 3 Day Next Double Day!